To carry out tissue culture, various climate conditions need to carefully and as desired be created. 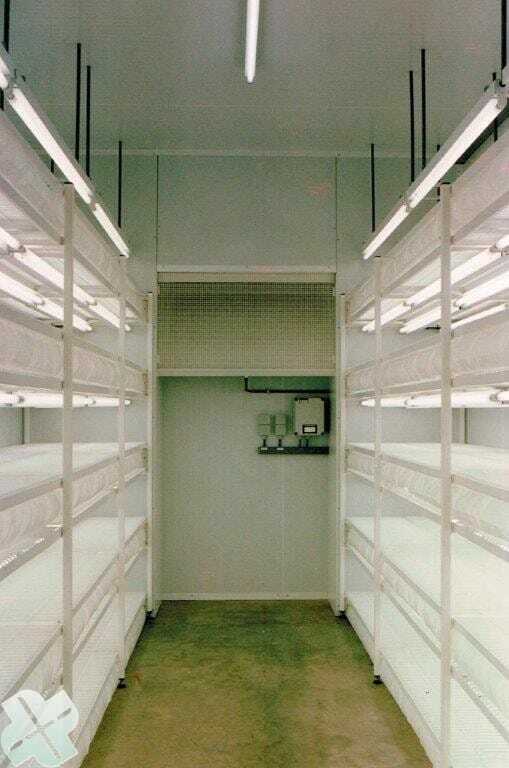 Tissue culture rooms are therefore configured and build in close consultation with the users. This consultation will take place with the researcher among others, to determine the correct configuration. It ensures they comply with the specific demands and requierements of the tissue culture. A detailled instruction guide is included. 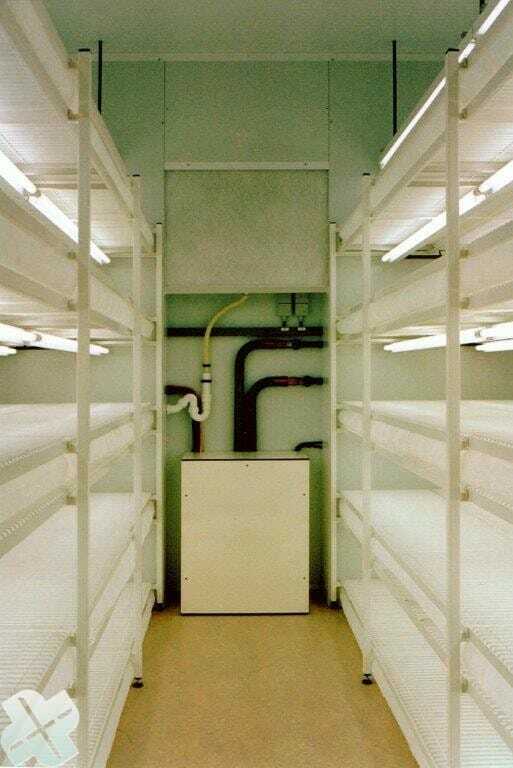 In the tissue culture rooms, 2 rows of configurations with special drawers are placed. The drawers consist of a double mesh grid with an air-cooled mattress in between. Through this mattress the cooled air is divided equally along the entire length of the shelf; up as well as down. Propagators are placed onto an opened drawer. The cold air from the matress ensures the temperature of the soil and the air in the propagator remains lower that the air surrounding the propagator. This way no condensation can take place inside the propagator. And subsequently, it prevents drops of condensation on the lid from interfering with the exposure of light. Special lighting fixtures hang below the drawers. The cool air from the bottom of the mattress ensures the neutralization of the warmth from the lamps. This type of air circulation is based on suppression. No air movement can be felt in the space. 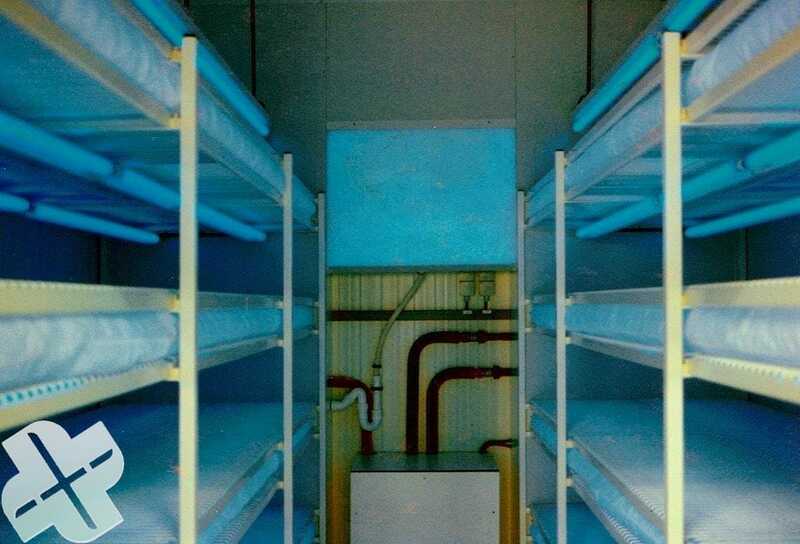 Partly through the combination of the air-suction filter and the air mattresses, a sterile environment is created. Lighting fixtures are an important element. 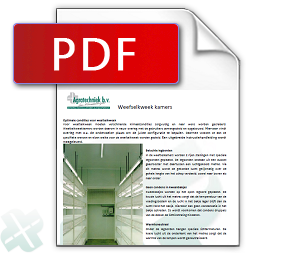 There are a lot of possibilites and the choice of the correct fixtures is determined in consultation with the user. Naturally you wil be adviced to make the right choice. Met de geavanceerde ABC processor kan elke gewenste luchtconditie, lichtsterkte en kleuren spectrum op een touchscreen worden ingesteld en bereikt. Eén ABC processor/ touchscreen kan meerdere droogkasten bedienen. Use the advanced ABC processor to configure and reach every desired air condition, light intensity and color spectrum on a touch screen. This can be done in various time stages and with or without gradual scale transition; day and night rhythm with dusk and morning glory is an option. The composed menu can be saved as pre-set and used for the next test; 32 pre-sets in total. The cooling can also be connected to the present cooling installations. The cooling can also be connected to a cooled water supply pipe. The matresses are made from white polyester cloth, washable at 85°C, with chlorine-containing washing detergent if desired. This also contributes to a sterile environment.